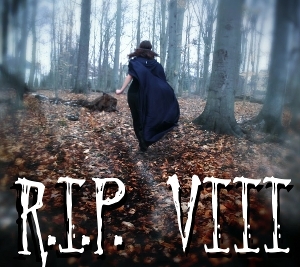 My first RIP VIII review and I could not be happier with it! 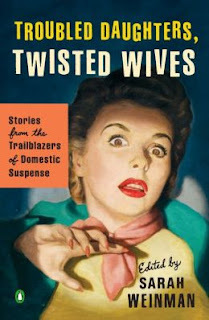 First of all, I love the subtitle - Stories From the Trailblazers of Domestic Suspense. I read it and couldn't understand how I had never before thought of "domestic suspense" as a genre name. Until now I've broadly titled everything suspenseful "thriller" or "mystery", but "domestic suspense" perfectly sums up my favorite type of thriller. I love stories about wicked children, murderous spouses, and obsessive spurned lovers. These short stories all range from the 1940's to the 1970's and feature the originators of this genre. The authors chosen for this anthology were perfect. I've added so many books to my reading list because of the amazing writing in these stories. As is the case with any anthology, some are better than others, but the overall quality was quite impressive. I think stories like these are going to have a pretty broad appeal. Obviously, they were right up my alley, but I think they'll appeal to anyone who enjoys the thriller genre, dark contemporaries, mysteries, short stories, or women's fiction. I was engrossed throughout and no single story stood out to me as less appealing or entertaining - I loved each one. It's also an ideal book for reading in short periods of time. You can pick it up and put it down without losing your momentum because it's made up of short stories. I highly recommend giving it a try, particularly if you like old suspense movies. I think you'll find that these stories feel very similar to movies like The Nanny, What Ever Happened to Baby Jane, and even some of Hitchcock's thrillers. Thank you to Viking/Penguin books for providing me with a review copy! Although this isn't really the genre I read, I love that cover and the title! i love the cover! so vintage and retro....and it sounds like a great book to kick off R.I.P.! Stopping by from the post Damian put up about a list of bloggers. Bloody brilliant - domestic suspense! I'm totally, and unashamedly, going to steal that! Plus I love the cover - it's brilliant.